Not to be confused with United States Air Force. The Pentagon, Arlington County, Virginia, U.S. The Department of the Air Force (DAF) is one of the three Military Departments within the Department of Defense of the United States of America. 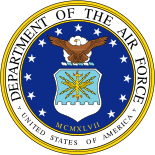 The Department of the Air Force was formed on September 18, 1947, per the National Security Act of 1947 and it includes all elements and units of the United States Air Force (USAF). The Department of the Air Force is headed by the Secretary of the Air Force (SAF/OS), a civilian, who has the authority to conduct all of its affairs, subject to the authority, direction and control of the Secretary of Defense. The Secretary of the Air Force's principal deputy is the Under Secretary of the Air Force (SAF/US). Their senior staff assistants in the Office of the Secretary of the Air Force are four Assistant Secretaries for Acquisition, Financial Management & Comptroller, Installations, Environment & Logistics, Manpower & Reserve Affairs and a General Counsel. The highest-ranking military officer in the department is the Chief of Staff of the Air Force who is the senior uniformed adviser to the Secretary, represents the Air Force on the Joint Chiefs of Staff, heads the Air Staff and is assisted in the latter capacity by the Vice Chief of Staff of the Air Force. By direction of the Secretary of Defense, the Secretary of the Air Force assigns Air Force units – apart from those units performing duties enumerated in 10 U.S.C. § 8013 unless otherwise directed – to the Commanders of the Combatant Commands. Only the Secretary of Defense (and the President) has the authority to approve transfer of forces between Combatant Commands. ^ "FY2019_Budget_Request_Overview_Book.pdf" (PDF). Retrieved 2018-10-29. "Airman Magazine: The Book 2010 – Personnel Facts and Figures". Airman Magazine, Volume 54 Number 3.